ANKARA (Reuters) - Turkish Prime Minister Ahmet Davutoglu on Saturday called on the United States to give unconditional support in the fight against Syrian Kurdish militants, illustrating growing tension between Ankara and Washington over policy in northern Syria. 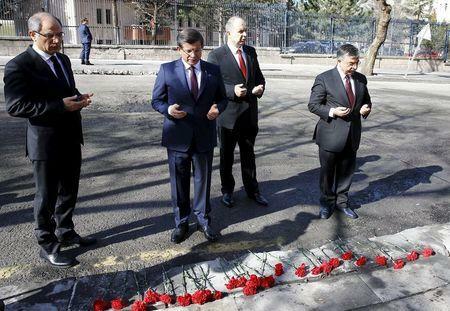 Davutoglu also said Turkey would tighten security across the country, especially the capital, after a car laden with explosives was detonated near military buses in Ankara on Wednesday, killing 28 people. Turkey says the Syrian Kurdish YPG, which the United States is backing in the fight against Islamic State in Syria, was involved in the bombing, working with the outlawed Kurdistan Workers Party (PKK). Washington, which does not consider the YPG a terrorist organization, has said it is not in a position to confirm or deny Ankara's charge the militia was behind the bombing. "The only thing we expect from our U.S. ally is to support Turkey with no ifs or buts," Davutoglu told a news conference following a five-hour security meeting with members of his cabinet and other officials. "If 28 Turkish lives have been claimed through a terrorist attack we can only expect them to say any threat against Turkey is a threat against them." The Kurdistan Freedom Hawks (TAK), a group that once had links to the PKK, on Friday claimed responsibility for the bombing. However, Davutoglu said that did not rule out the responsibility of the YPG, calling the TAK a "proxy" that claimed the bombing to shield the international reputation of the Syrian Kurdish fighters. The YPG's political arm has denied the group was behind the Ankara attack and said Turkey was using the bombing to justify an escalation in fighting in northern Syria. Turkey reserves the right to carry out operations at home and abroad against terror threats, President Tayyip Erdogan was quoted as saying on Saturday, in comments that suggest Ankara could increase shelling of YPG positions. "Turkey will use its right to expand its rules of engagement beyond (responding to) actual attacks against it and to encompass all terror threats," the pro-government Daily Sabah newspaper quoted him as saying at a speech in Istanbul. Washington has called on Turkey to stop its recent shelling of the YPG. Ankara says it is doing so within the rules of engagement and in response to cross-border fire from the insurgents. President Barack Obama on Friday spoke to Erdogan in an 80-minute telephone call, sharing his concerns over the Syrian conflict and promising his support. A State Department spokesman later told reporters Washington would continue to support organizations in Syria that it could count on in the fight against Islamic State - an apparent reference to the YPG.